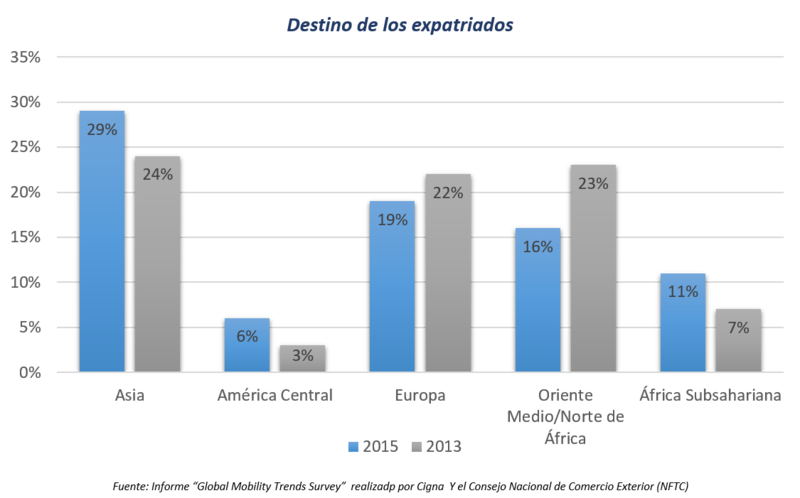 In the context of our previous article “BEING AN EXPAT WILL BE IN THE PLANS OF MANY EMPLOYEES”, we will keep on analysing the data obtained out of the “Global Mobility Trends Survey 2015”, released by Cigna and the National Foreign Trade Council (NFTC). The survey shows data from 2700 temporarily transferred workers out of 156 countries . We would like take a closer look into the data and determine which areas have higher demands of this kind of employees, where do they come from and where do they go to work, and the reasons why companies choose to hire expatriates to complete their workforce. Which industries employ the most foreign workers? 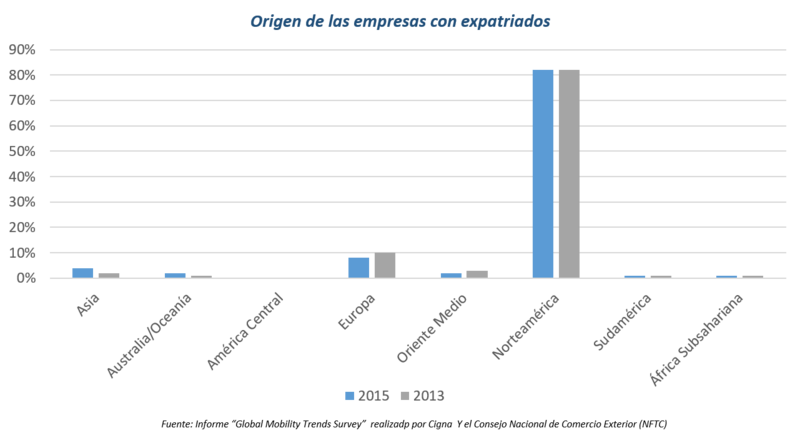 The energy industry hired more expats than any other last year according to the “Global Mobility Trends Survey 2015” (30%) and it also was the sector that hired more long term international employees. The technology industry (11%) and the production and manufacturing industry (10%) ended in second and third place. It’s important to point out that the company services sector (accounting, maintenance) experienced a 12% to 6% drop of new workers in 2015 compared to data from 2013. 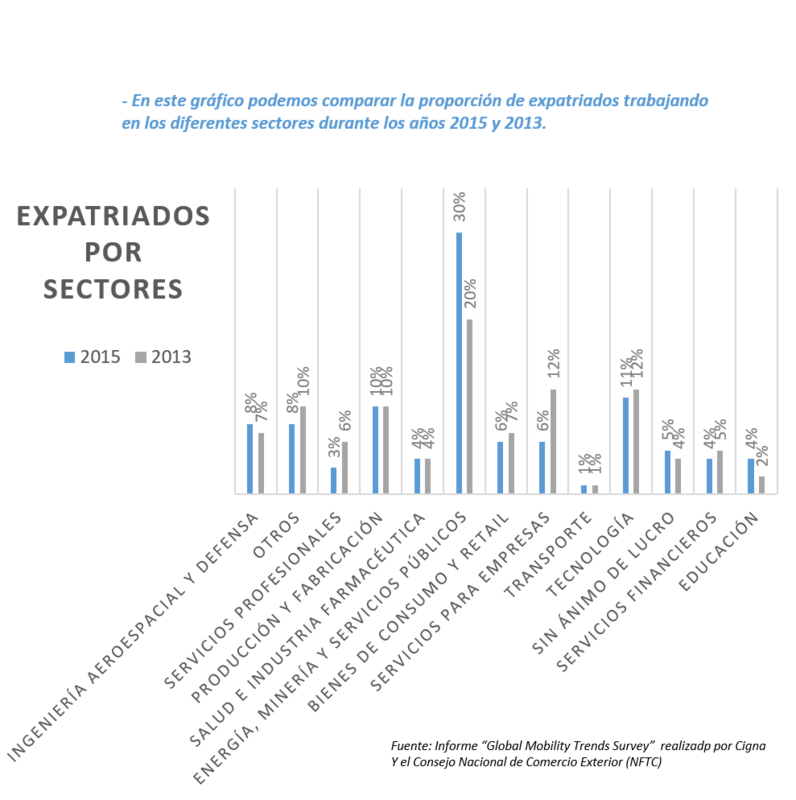 Which industries employ the expats? Which are the expats countries of origin? Most expatriates come from the United States (42%), Europe (23%) and Asia (14%). Although the US leads the statistics, there has been a progressive drop of US expat workers because american transfers are more expensive. On the other hand, foreign workers from other countries keep on rising in numbers. What are the expats destinations? Asia has been the main destination for expats in the last years. Europe still is in second place even though it has experienced a drop in the number of international workers compared to the same survey of 2013. Sub-saharan Africa has shown an increase in expat numbers similar to the one in Asia. Why do companies invest in expats? The following chart shows which are the countries that send more workers overseas annually. American companies are notably ahead of others included in the survey.